This assembly instruction applicable to DIN 2353 fittings shows suitable make-up of fittings into seamless pipe in accordance with DIN 3859. - Assembly by using pre-assebly tool. 1.0 Saw the tube at right angle. An angular offset of 1/2" in relation to the tube axis is permissible. 1.1 After clean, lightly deburr tube ends at the inside and outside edge. 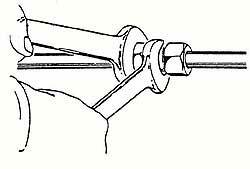 1.2 Don't use a tube cutter because this would cause formation of considerable burrs and an angular cut. Use sawing machines or devices instead. 2.0 Lubricate thread and inside of fitting body also cutting ring and thread of nut. Don't use grease. 2.1 Place nut and cutting ring on tube shown. 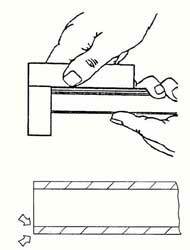 Ensure cutting ring and nut are facing the right way. 3.0 Press tube into fitting body, up to tube abutment, then hand-tighten the nut. Caution! Any deviating number of tightening turns reduces the nominal pressure and the service life of the fitting and may cause leakages or slipping of the tube. 5.0 Check penetration of cutting edge. A visible ring of materials should fill the space in front of the cuttin ring and face. Cutting ring may turn on tube, but should not be capable of axial displacement. 6.0 Each time the fitting is dissambled, the nut must ne retightened firmly using the same toque as required for final assembly. 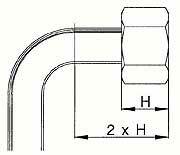 7.0 Minimum length of straight tube and for tube bends, up to start of the bending radius must be at least twice (2 x H) the nut length(H).